4 Non Blondes began in the fall of 1989 with guitarist Shaunna Hall, bassist Christa Hillhouse, drummer Wanda Day, and vocalist Linda Perry, in the wake of The Lesbian Snake Charmers, a punk / rockabilly/ reggae project led by vocalist Jai Jai Noire for whom Hall, Day and Hillhouse provided the musical backbone. After seeing the Charmers in a local dive called The Nightbreak, Linda and Shaunna had a conversation which eventually led the the first band rehearsal in October 1989. The band was named a few weeks later. Hall, Day and Hillhouse were sitting in Washington Square Park, in San Francisco, tossing around band name ideas when a small child walked past with his mother, and tried to grab a pizza crust from the top of a trash recepticle to feed the pigeons. HIs mom quickly averted his attention, saying, "don't touch that, it's dirty with all the pigeons and the people!" 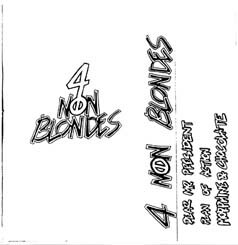 Since we they were the only people besides the "Blonde " family walking by, Hall sarcastically responded, "You mean all the Non-Blonde people! " 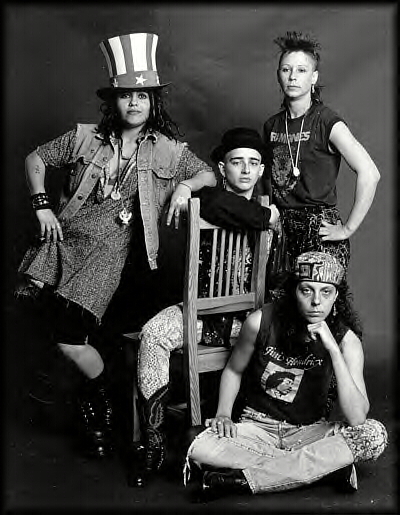 4 Non Blondes began writing and rehearsing at Turko Persian Rug Factory in a studio shared by Wandas' buddies, and soon had their first gig at Female Trouble, a weekly club hosted by Nancy Kravitz at Nightbreak. Within a short period of time, the band was pulling in fans and eventually recieved the honor of top 3 most requested songs on KUSF 1990 for their demo version of Dear Mr. President. The band won an award for best something or another in the first SF Weekly Music Awards, or Wammies, and quickly gained mainstream local support and critical aclaim, regularly playing to loyal fans at places like DNA Lounge, The Paradise Lounge, Slim's and opening slots at the Warfield Theatre. Local success turned into a record deal with Interscope Records with the help of manager Katrina Sirdofsky and rock attourney Brian Rohan in July 1991. Day was replaced by Dawn Richardson prior to the recording of "BIgger, Better, Faster, More!!! ", and somewhere in the middle of that recording, Hall left the group. Session player Louis Metoyer finished the recording, and Roger Rocha was added after the recording was completed in 1992. The debut album, Bigger, Better, Faster, More!, was a worldwide smash hit selling millions of records, peaking at number 11 on the Billboard Top 200. Hall comtributed songs, including Mrphine & Chocolate and Spaceman, which was released as a single in 1993 and peaked at #39 on the Billboard Mainstream Rock Tracks chart.